Home » Catch spring in the act! In some parts of the U.S. our Nature’s Notebook observers may be thinking about—and possibly observing—renewed activity of their perennial shrubs and trees. This probably seems surprising when winter is still delivering its bluster to some areas. It is simply a statement of our continent’s enormous ecological and climatic diversity... and so, we will take a look at what to watch for when our trees and shrubs begin to signal their transition from dormancy into renewed activity over the next few months. That means focusing on the plant’s buds and meristmatic tissues (the areas of a plant's cell generation). How do I know when to start reporting "yes" for breaking leaf buds or flowers or flower buds? 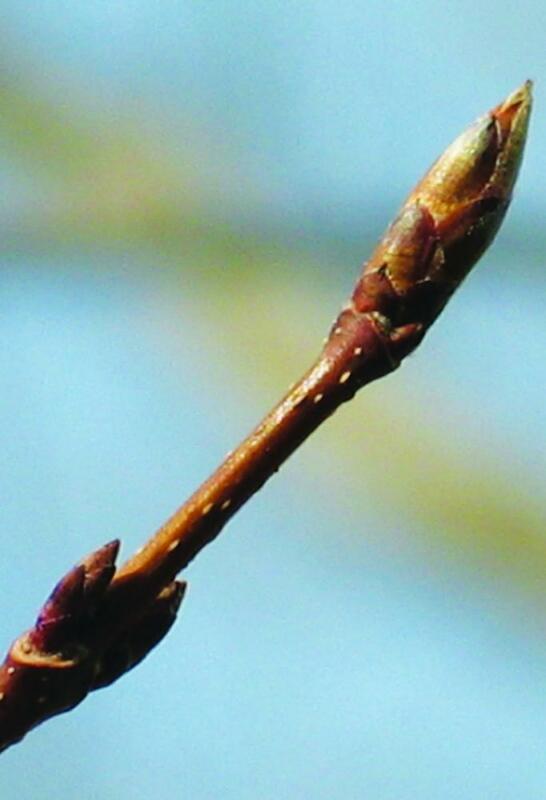 Remember that for breaking leaf buds, you should not start reporting "yes" until you see the green leaf tip visible at the end of the bud. The information below will help you know when your dormant buds start to become active. The phenophase of flowers or flower buds can be tricky, as you should not report a "yes" for flower buds that are tightly closed or dormant. The information below will help you decide when a flower bud has become active. How do I know which buds are which? 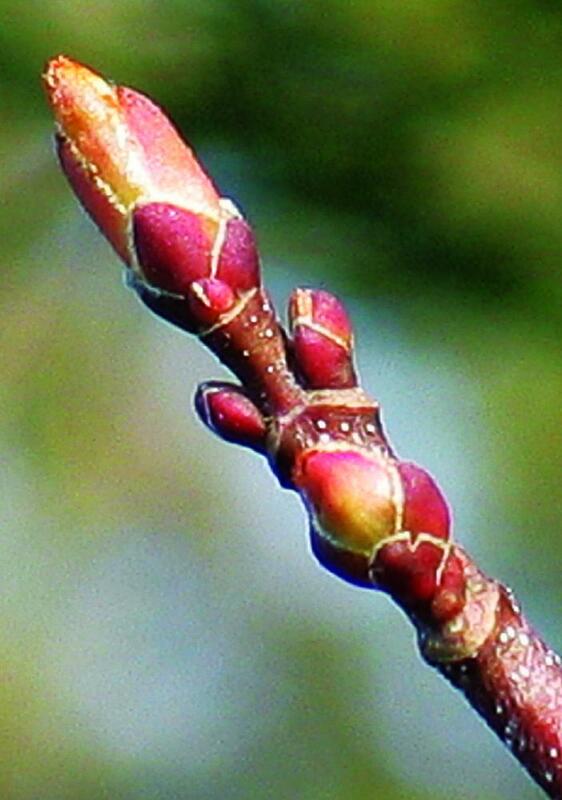 Distinguishing the leaf buds from the flower buds. Is it a leaf bud (vegetative bud) or a floral bud (reproductive bud)? Or both (a mixed bud)? In some species they might be easy to differentiate. Often experienced botanists/ foresters/ arborists/ pomologists/ horticulturalists, or a species’ description, may describe a plant's flower buds as being plumper and rounder and the plant's leaf buds being narrower and sharper at the bud tip, such as with the examples of lilacs, below (left photo, three leaf buds with one bud, exposing tiny leaves; right photo, flower buds with one bud starting to expose tiny flower buds peaking between the bud scales). 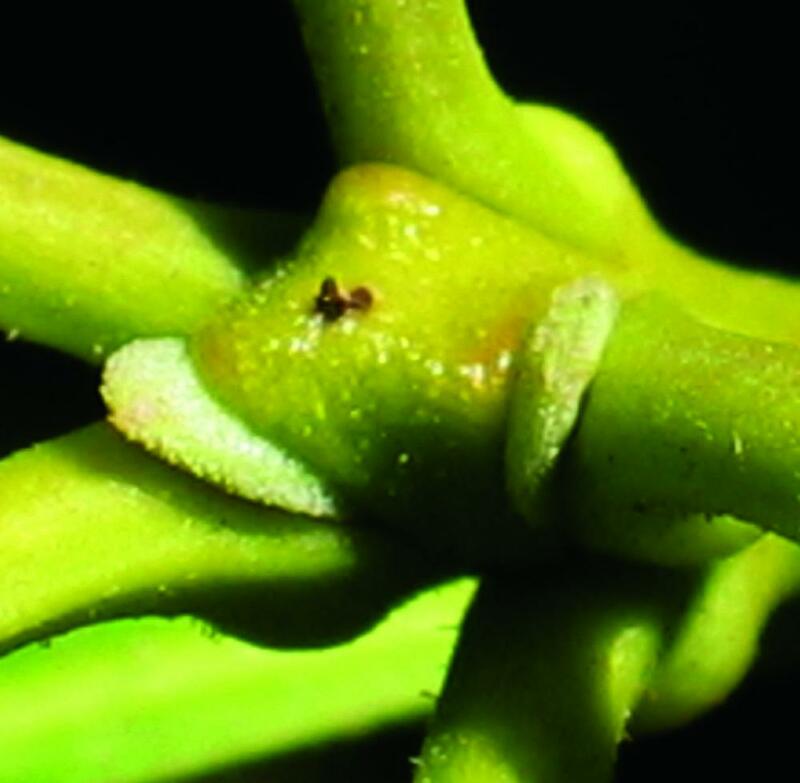 Often a plant's description identifies bud type based on the position within the plant—that is, what type of buds would more typically be found at the twig’s and branches’ terminal ends or along the older stem nodes (old growth versus young or new growth), and the general location within the plant (high up in the canopy versus lower within the canopy of the plant). These descriptions provide very helpful tips. Yet, as you know, some generalizations don’t hold true 100% of the time. The simplest suggestion to figuring out the dormant bud types on your plant is to try to learn as much as you can about the plant species you have chosen to observe. Read all the tips and descriptions. Look at photos of the plant in all seasons (you might keep your own photo record over an annual cycle). For some plants, the flower and leaf buds differ so greatly there will be no difficulties in diciphering the different bud types once you have looked at informative photos. It may be common for the species to have mixed buds—that is, buds containing both leaves and flowers. Yet, be aware that not all buds on a mixed bud species will always be mixed—in some species, some buds will simply be leaf buds, others only flower buds, and others will be mixed buds. Take for instance, a river birch tree (Betula nigra)—a monoecious species having separate male and female flowers—where the floral buds and leaf buds appear on the tree in the fall but are dormant over the winter. 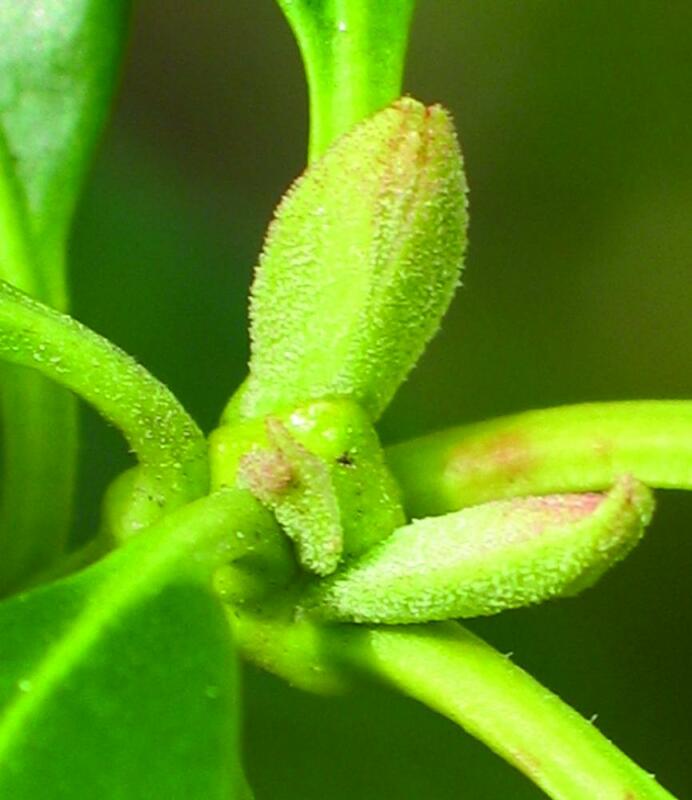 The male and female flower buds look very different and it is easy to tell them apart, yet, it turns out that the female flowers are hidden and contained within a mixed bud. 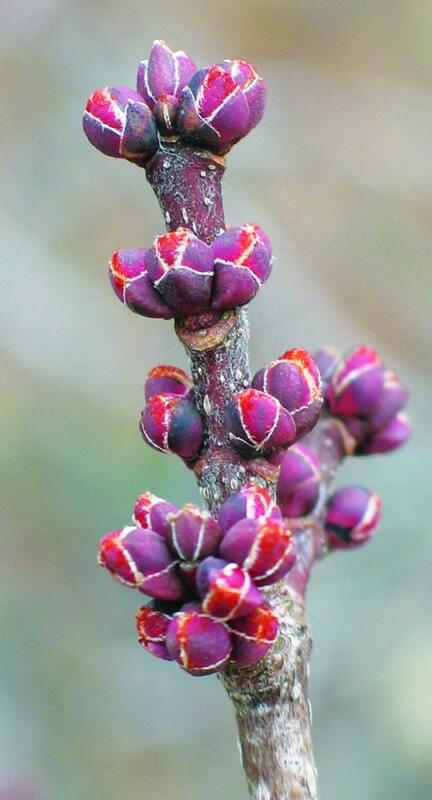 And also, buds that contain the female flower buds look very much like those that contain only leaves. See the examples below of a river birch’s buds (clockwise from top left): dormant male flower buds (catkins) found at the terminal end of a branch (new growth), dormant leaf and mixed buds found on long and short shoots along the branches (older growth), an opened mixed bud containing a leaf and a catkin of female flowers, and an opened leaf bud containing several leaves. In the end, it will take an observer’s careful and continued observations to catch the various activities and beginning and end of phenophases, and then report on those activities over time. Keeping in mind that a bud type can be leaf, flower or mixed, let’s now consider a bud’s structure. Does the bud have scales that cover and hide the embryonic leaves and floral parts, or is it naked with tiny leaves and flower parts and buds tightly packed against each other or buried in hairs, or is the bud so tiny and embedded in stem tissue that it can’t be seen? And, what might be some cues of these buds transitioning from dormancy to renewed growth? 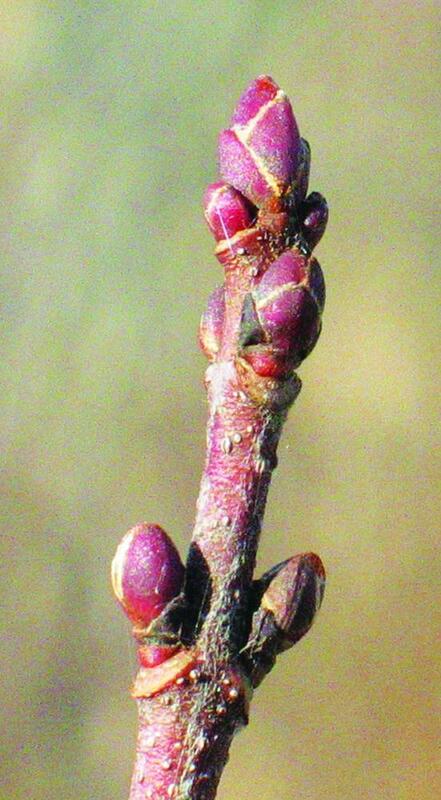 Watching for the transition from dormancy into renewed activity on trees and shrubs that have scaled buds. 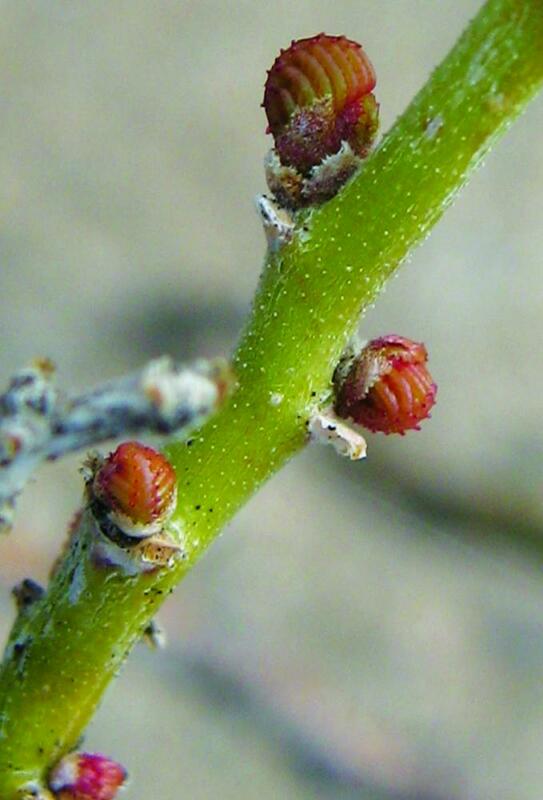 Dormant scaled buds have protective bud scales that surround the embryonic leaves, flower buds and the meristematic tissue at the ends of branches and at the stem nodes where axillary buds may have developed. Generally, these buds form at the end of a growing season and enter into a resting phase—dormancy—during the stressful seasons. 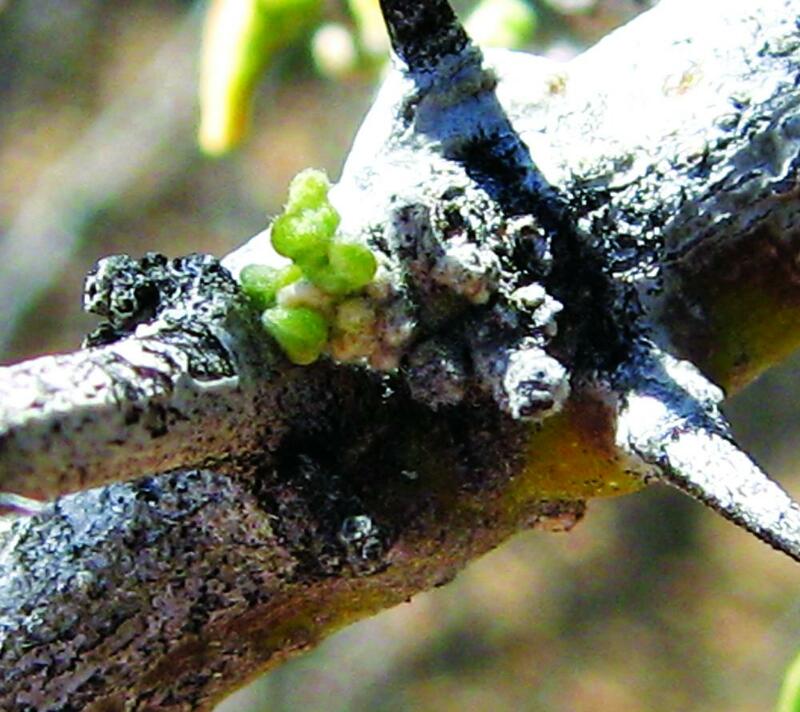 Many of the species’ buds, as they transition from dormancy into a new activity and the growing season, are described as "swelling"—that is, subtle activity of bud lengthening or plumping from internal growth, and the bud scales ever-so-slightly loosening. Sometimes this occurs along with a subtle or not-so-subtle color change. If you have experience with your plant, you may more easily detect the days these activities begin if you are watching closely. 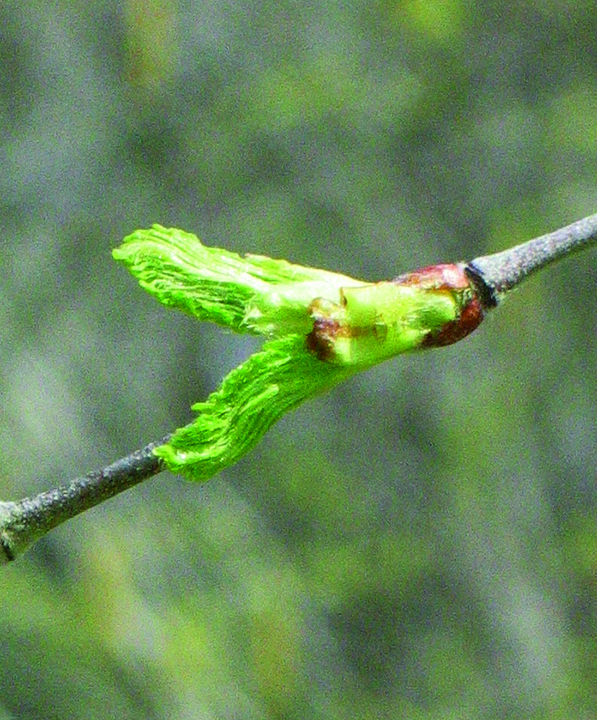 The "swelling" bud activities are not recorded for Nature’s Notebook, yet they signal that very soon an observer will be recording phenophase observations for "Breaking leaf buds" or "Young leaves" or "Flowers or flower buds", depending on the plant species and bud type that is initiating activity. The examples below of red maple (Acer rubrum) buds below show a species’ that has separate leaf and floral buds - the set on the left shows, first, a dormant leaf bud at the tip of the twig and, next, a swelling leaf bud. Observe how the scales have subtly lengthened and begun to separate. The set on the right shows, first, dormant flower buds and, next, swelling flower buds. Again, a close look shows subtly swelling buds where the scales have begun to shift and separate. Below are more examples of swelling scaled buds. The first set is northern red oak (Quercus rubra, left, dormant; right, swelling buds) and the second set is sugar maple (Acer saccharum; left, dormant; right, swelling bud). An unusual scaled bud (not all scaled buds look, or act, the same). Some scaled buds do not have imbricate scales (scales that overlap each other like roof tiles) as the previous examples have. The following photos show buds with valvate scales (two scales that cover the tiny leaves and meet together at a seam) of an evergreen species, mountain laurel (Kalmia latifolia). For this evergreen species, the buds form after the stressful season of winter, and their appearance signals the plant's move out of dormancy. 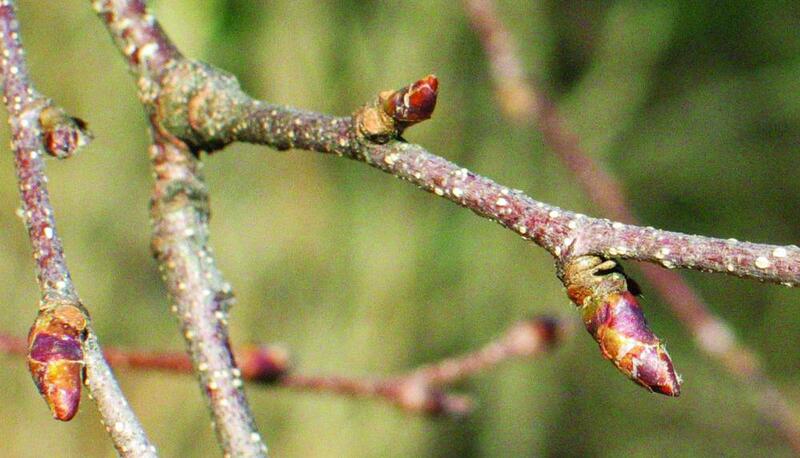 When the leaf buds first begin to form, they look like little tongues that surround the terminal end of a stem. As they develop, you should easily be able to see the seam that develops where the two scales meet. 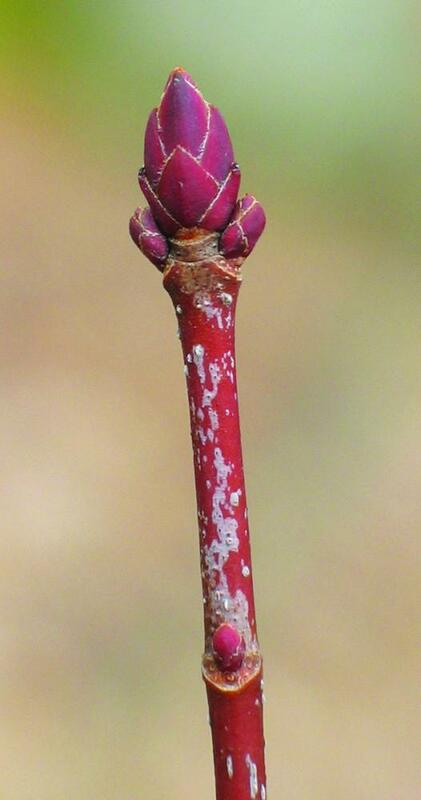 The bud gradually gets larger and begins to subtly swell; you should be watching for that seam to separate and getting ready to make recorded observations of the tiny leaves as they are exposed for the "Breaking leaf buds" phenophase. 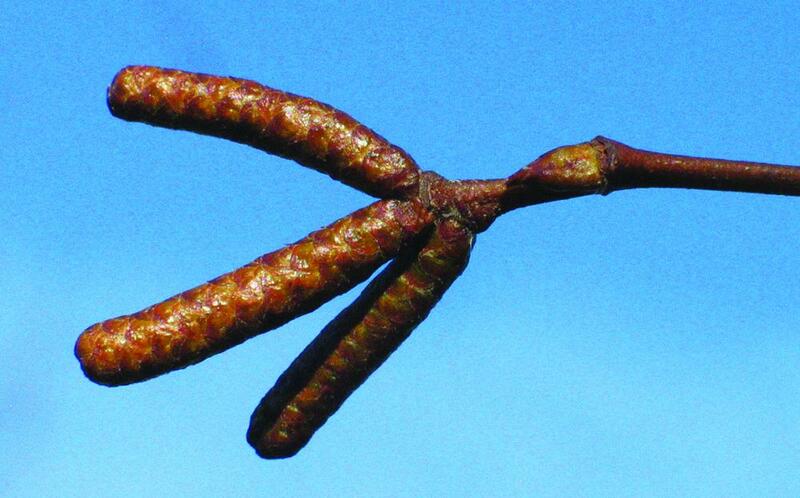 Be aware that not all valvate buds develop as this mountain laurel example, in fact they often look similar to the previous example of large tough-scaled buds located at the ends, or along, twigs and branches—excepting that they have two bud scales that meet at a seam along the center of the bud. And as the earlier examples, they form their buds before stressful seasons and lie dormant. 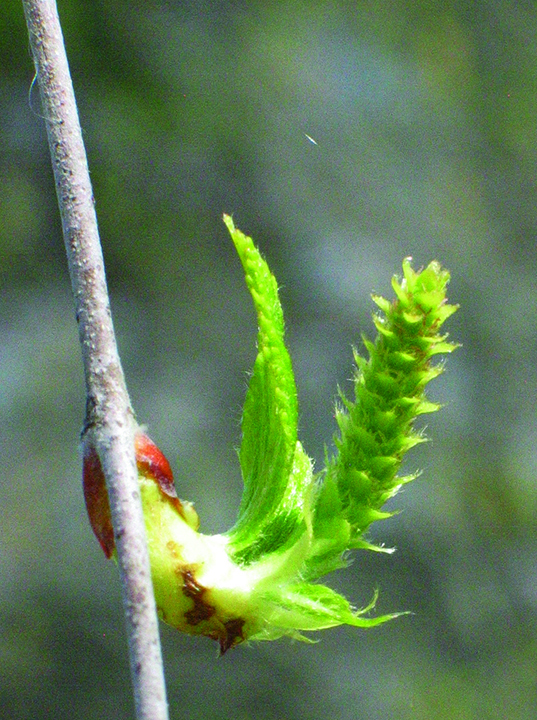 Similarly, an observer would be watching for an enlarging bud and for the bud scale seam to split apart to expose the new leaves. 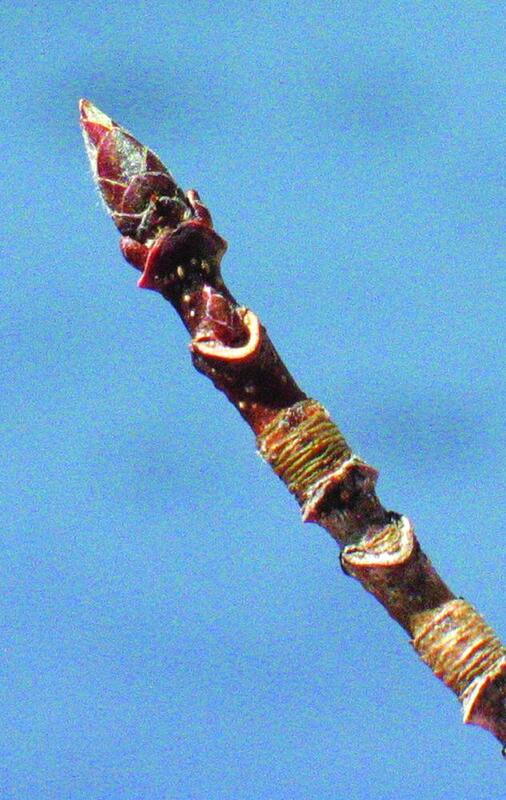 Watching for the transition from dormancy into renewed activity on trees and shrubs having naked buds—that is, a bud having tiny embryonic leaves folded tightly together when dormant, sometimes very hairy or with other protective anatomy, that have no protective bud scales. These interesting species employ a different way to get their resting buds through stressful seasons. 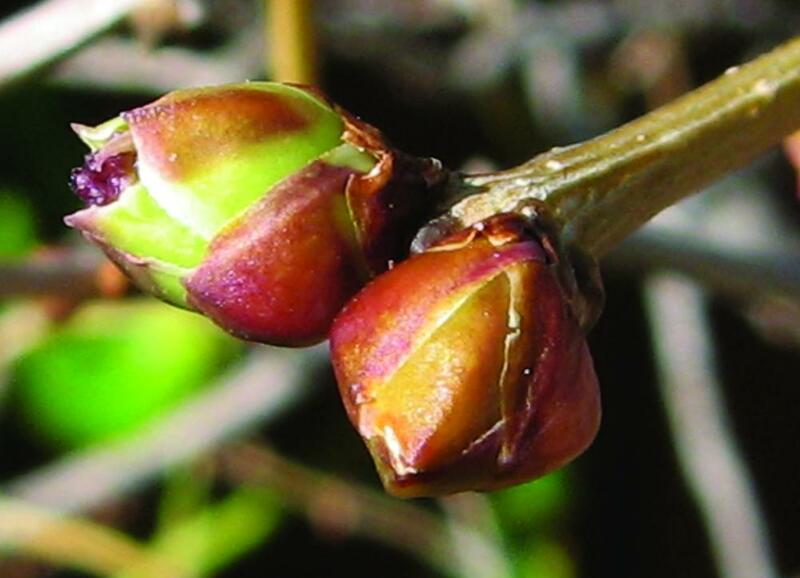 Naked buds have no protective bud scales, but instead may be very hairy and fold their tiny leaves and floral parts protectively around or against each other. 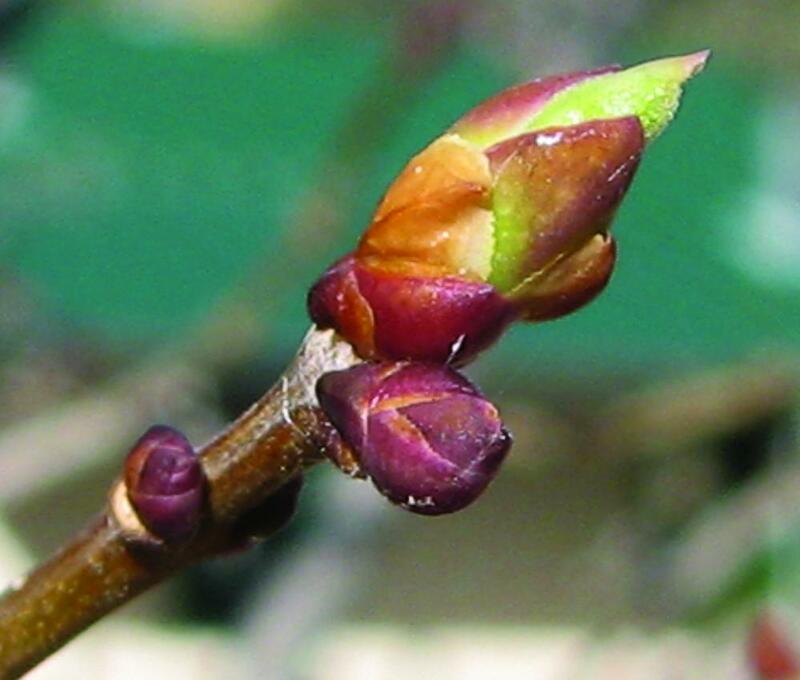 These buds also display subtle signs of coming out of dormancy, but the signals for "Breaking leaf buds" may be a bit confusing at first to new observers. 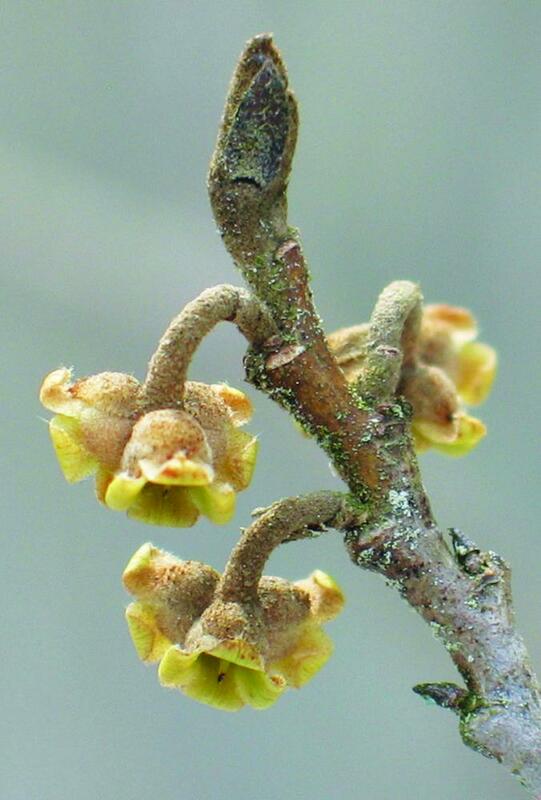 The example below highlights the naked buds of American witchhazel (Hamamelis virginiana). The photo on the far left shows a dormant leaf bud at the terminal end of a branch (surrounded by dormant floral ovaries at the stem nodes below it) with its leaves tightly folded together. The middle photo shows a naked bud that is becoming active and "swelling". 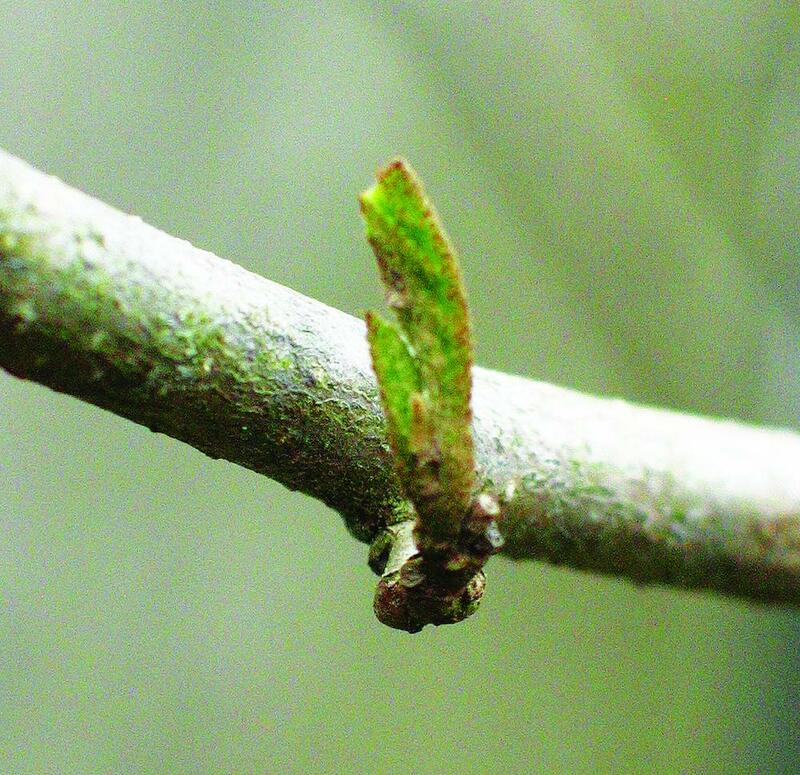 And, the photo on the right shows a bud in the "Breaking leaf buds" phenophase just for comparison, to help readers understand the difference between the "swelling" stage and the "Breaking leaf buds" phenophase. 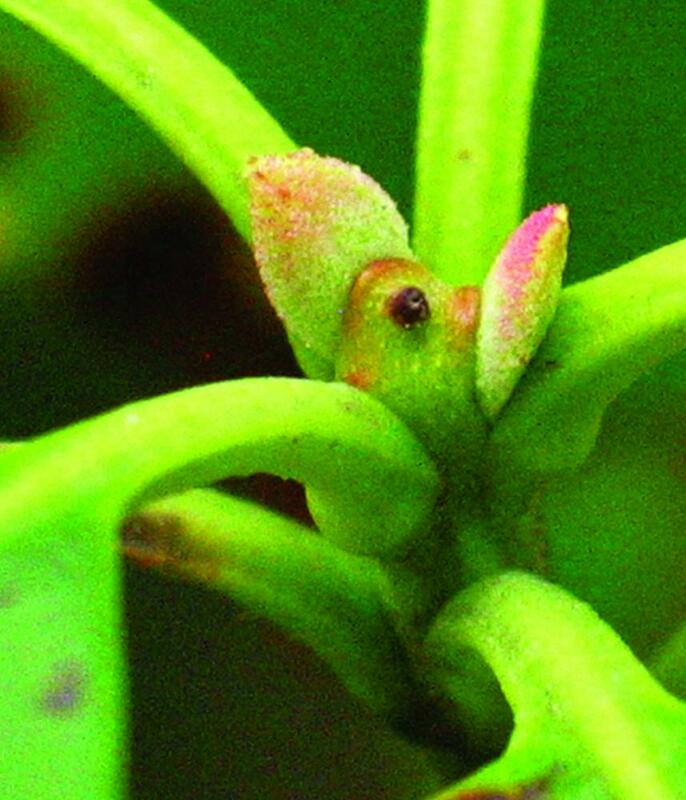 For this species, "the naked leaf bud is considered "breaking" once the bright green leaf surface is visible between unfolding halves of the tiny, brownish leaf blade, but before the leaf blade has unfolded enough to appear more or less like a small version of the adult leaf." Again, it is the "Breaking leaf buds" activity (the far right photo) when you would start recording observations. Watching for the transition from dormancy into renewed activity on trees and shrubs having no discernable buds. Many of the plant species of the arid lands are drought-deciduous species. These species often, but not always, drop their leaves during cold-stress (winter) and will also drop their leaves during water-stress periods occurring at any time of the year. Some of these species can drop their leaves several times a year, as needed, to reduce the chance of death by limiting water loss through leaves when there is a lack of available water. These species often have no discernable buds, but mostly, the buds are so tiny and imbedded in plant tissue as to not be visible. 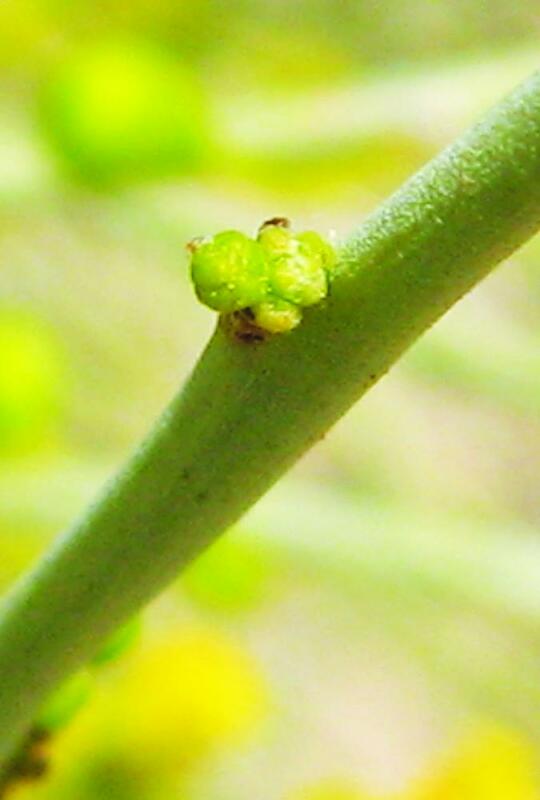 The first signal that the plant has become active again are tiny "bumps" that form at the stem nodes or along short shoots that will very quickly develop into tiny leaves and flower buds. You would have to be regularly watching the dormant twigs, branches and stems to catch the formation of these little "bumps". As an observer for Nature’s Notebook, catching these activities will alert you to be on the lookout to catch and record the first seasonally active phenophases for your plant! So be on the lookout for swelling buds and shifting scales and nubs and bumps of active growth on your perennial plant. You won’t be recording these activities onto Nature’s Notebook datasheets just yet, but if you are seeing these bud activities, it won’t be long before you will be recording "Breaking leaf buds" or "Young leaves" or "Flowers or flower buds" phenophase observations. If you have questions about these plant activities and need more detailed information and explanation—with photos—regarding when to start reporting observations, check out the draft of our Phenophase Primer - Section 1 at https://www.usanpn.org/pubs/reports#Education (a download-able .pdf file). The Table of Contents is on page 8—to get you to the topic you need quickly. The Primer, as noted, is still yet a draft, but many of the subsections are complete and ready to fill you in on all the details. This link also gets you to additional support materials. Spring is coming! Enjoy observing the subtleties of its approach! A big thanks to all of our Nature’s Notebook observers for patiently watching as spring activities become evident! We depend on you to make all of those careful observations so that we can understand plant response to our environment. It takes your careful observations—and your dedication—to catch spring in the act!